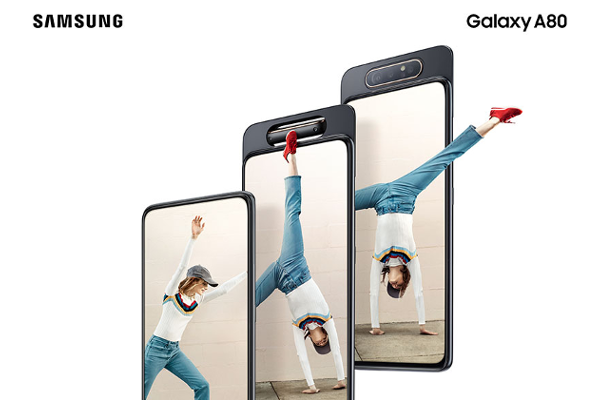 SAMSUNG Galaxy A80 goes official with 48MP pop-up rotating camera, 6.7-inch FHD+ Super AMOLED Infinity Display and Snapdragon 730G. Samsung Electronics today reveals the Galaxy A80 - a new smartphone that offers 6.7-inch full-screen display, Samsung's first revolutionary 48MP rotating camera and a 3,700mAh battery. The Galaxy A80 features a 6.7-inch FHD+ Super AMOLED Infinity Display with 1080x2400 resolution. It includes button-activated or hands-free Bixby and available in three colors: Angel Gold, Ghost White and Phantom Black. The handset runs Android 9.0 (Pie)-baed One UI and comes with an On-Screen Fingerprint sensor. The Samsung Galaxy A80 is powered by a 2.2GHz Snapdragon 730G octa-core processor. It is accompanied by 8GB of RAM and 128GB of internal storage capacity. It doesn't have a microSD card slot for expandable storage. The device comes with a 3,700mAh battery with 25W Super Fast Charging. Created with Samsung's first rotating camera, the Galaxy A80 sports a 48MP main camera and its 3D Depth camera offers Live Focus videos by scanning objects for measurement and depth. It comes with an 8MP secondary sensor with a 123-degree ultra wide-angle lens. When users select the selfie mode in the camera app, the three cameras automatically pop-up from the back of the phone and rotate. The Super Steady video mode helps you effortlessly capture content by reducing video shake to ensure smooth, pro-level action videos. And with other intelligent camera features such as Scene Optimizer that can recognize and enhance up to 30 scenes, and Flaw Detection that automatically identifies glitches before you click. Samsung Galaxy A80 will be available starting from May 29. Price will be announced at the time of the launch.